Chikurachki (Paramushir Island): Ash emissions and explosions of smaller size than the initial one on Sunday evening continue to occur. 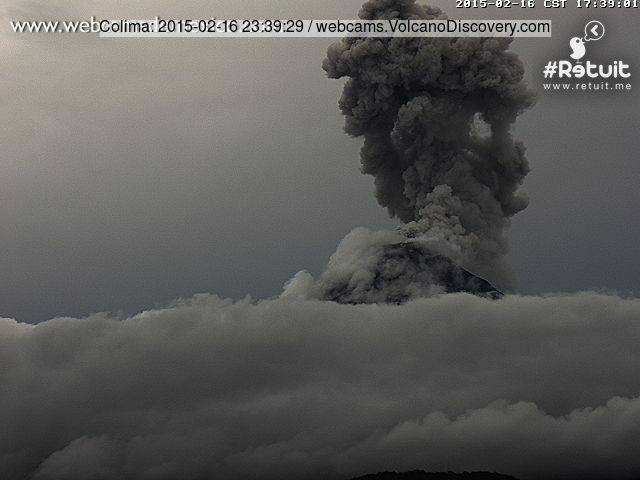 Ash plumes reported rose to 12-15,000 ft (3.6-4.5 km) altitude. Colima (Western Mexico): Explosive activity remains elevated. At intervals of tens of minutes to few hours, small to moderate vulcanian explosions occur, often producing ash plumes rising 1-2 km above the crater. Villarrica (Central Chile): Activity from the summit vent has increased, with an average of 5 strombolian-type explosions per minute observed recently. Bright incandescence is visible above the crater. Yellow preventive alert for the communes Villarrica, Pucón and Curarrehue remains in place by Civil Protection (ONEMI). Access to the crater is closed at the moment.